The packaging industry is currently experiencing a revolution led by the rise of artificial intelligence. While it’s no secret that AI is gradually working its way into our daily lives, it’s having an especially profound effect on the future of packaging and distribution. Smart packaging warehouses are no longer a theoretical idea of the future; they are starting to become a reality. Artificial intelligence uses computer systems to perform tasks that have traditionally required independent human intelligence. This includes tasks requiring visual perception, speech recognition, decision-making, and language translation. Advanced AI now has the ability to manage all of that on its own. The concept of a smart warehouse harnesses the newfound abilities of AI by integrating data from many different inputs across a warehouse space. Using the data, AI can make informed and intellectual decisions in the packaging and distribution process. As an example, it’s possible for AI to calculate consumer-ordering behavior, machine use, and resources to control energy usage in a factory in the most efficient manner. 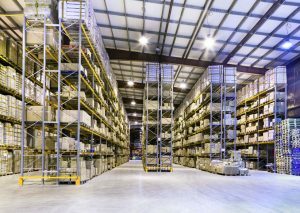 Manufacturers want to stay ahead in their industries by using smart warehouses to maximize efficiency. AI can learn and recognize patterns, regularities, and interconnections using nothing but data, then dynamically adapt to each new scenario in the supply chain process. The result is steady efficiency and increased production. In essence, AI has the power to anticipate situations just like a human would. There are many benefits to the future of AI-powered smart warehouses. Quality control, classification, and tracking can all be enhanced and supercharged with AI in the lead. Quality control, for example, is an absolutely necessary component of packaging and distribution alike. AI machines are capable of performing a wide range of quality control tasks and sending out notifications accordingly. It’s also possible for AI machines to learn from people rather than replacing them. Manufacturers don’t want to lay off their entire workforce, but they want to find a balance that improves interactions between humans and machines. This balance can optimize AP integration and improve success of the smart warehouse. To learn more about packaging and predictions for the future, call (781) 986-7500 to speak with a professional an Econocorp, a worldwide leader in cartoning, tray forming, and casepacking.